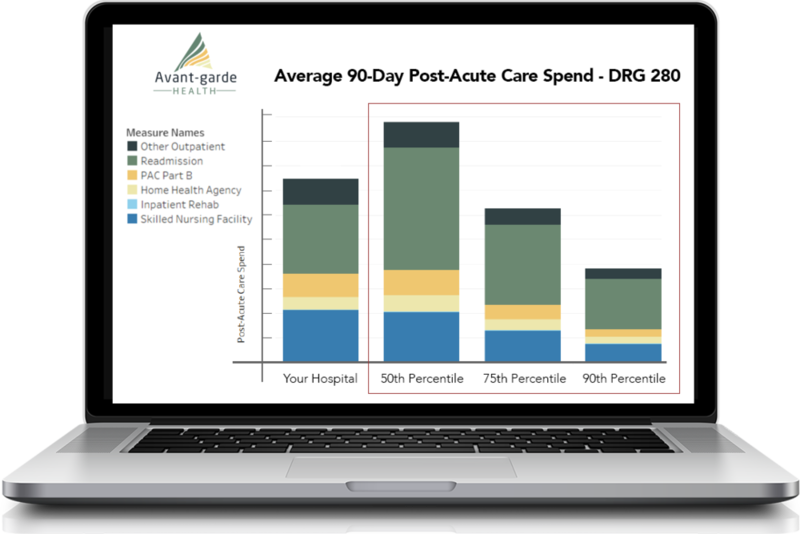 In one seamless interface, we pull in data from multiple sources including patient reported outcomes, hospital cost and process information, as well as CMS claims data – so we are able to provide users with an analysis across the continuum of care – both inpatient and 90-days post-discharge. Our data scientists clean, scrub, catalog, risk-adjust data and automate Time-Driven Activity-Based Costing (TDABC) to provide over 60 rich and intuitive visualizations that identify opportunities for improvement. Because data is accurate and actionable, it's trusted and regularly presented at monthly physician section meetings, department meetings and hospital leadership meetings. Because we aggregate data across our cohort, we are able to build insightful national benchmarks across each quality and cost metric. These allow provider organizations to see how they stack up against other organizations in our cohort and determine where they have opportunities for improvement relative to their peers. Our analytics are granular at the individual procedure level, so they are meaningful to providers who perform these procedures. Using a combination of DRG, ICD and CPT coding algorithms we segment patients into clinically relevant populations that promote engagement among clinicians and administrators alike. Did You Apply For BPCI Advanced?